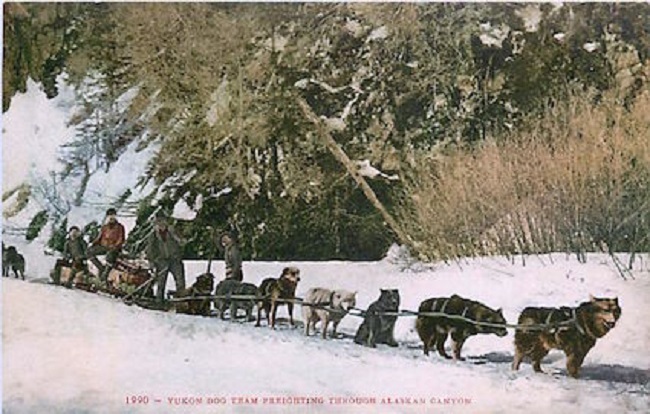 “Yukon Dog Team Freighting Through Alaskan Canyon," photographic postcard, tinted, c. 1910–15. Printed by the Edward H. Mitchell Company (series #1990). The original photograph was taken circa 1897 and distributed in several forms by the Juneau-based studio of Lloyd Winter and E. Percy Pond. At the height of the Klondike Gold Rush, twenty-one-year-old Jack London headed to the Yukon with his brother-in-law and spent the winter of 1898 in a cabin south of Dawson City. By the spring he was suffering from advanced scurvy. When the river ice began to melt, his friends made a raft from the timbers of their cabin and, accompanied by a medical doctor from the camp, London headed to Dawson, where his recovery was aided by a diet of potatoes. He would lose four front teeth from the disease, adding to the several he had lost as a teenager “cheerfully somewhere in a fight” (as one of his teachers later recalled). With two new companions, he then traveled 1,500 miles down the Yukon River in a small boat and, helped along by the kindness of strangers, headed on a steamer to Port Townsend, Washington. From there, he took a ship back to San Francisco, arriving in July. Returning home to Oakland with gold dust in his pockets worth less than five dollars, London resolved to become a writer. His early stories were based on his experiences in the Klondike, but his very first inquiry was met with the response, “Interest in Alaska has subsided in an amazing degree.” He would eventually collect over 650 rejection slips, most of which are housed today in the archives of the Huntington Library. Five of the Overland stories, including “The White Silence,” portray Malemute Kid, a Yukon native living among white settlements. The Malemute Kid stories made London famous, particularly when the sixth in the series, “An Odyssey of the North,” was published in January 1900 by the prestigious Atlantic Monthly, which paid him $120—three times as much as he had received for the first five tales combined. 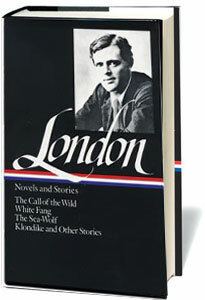 All six, along with the other three selections that had appeared in Overland, were collected in London’s first book, The Son of the Wolf. Notes: The first page of the story, Mason mentions an Epworth to refer to a chapter of a Methodist religious organization for young adults. The distance between Arctic City and Fort Yukon (p. 299), which Mason uses as a hypothetical example of a telephone line, was 200 miles. (This was not farfetched in the late 1890s: The February 1900 issue of Popular Science Monthly reports that telephone service had been established within Dawson City, and two lines allowed communication “with the nearer mining region.”) A gee-pole (p. 300) is the steering shaft lashed to the front of a dog sled. The ice-run (p. 304) is the spring break-up of ice rushing down the river. “Carmen won’t last more than a couple of days.” Mason spat out a chunk of ice and surveyed the poor animal ruefully, then put her foot in his mouth and proceeded to bite out the ice which clustered cruelly between the toes. . . . If you don't see the full selection below, click here (PDF) or click here (Google Docs) to read it—free!